Matti Vanhanen is back into politics. He has been prime Minister for 7 years, from 2003 to 2010, Chairman of the Centre Party (Keskusta) and also in 2006 President of the European Council. 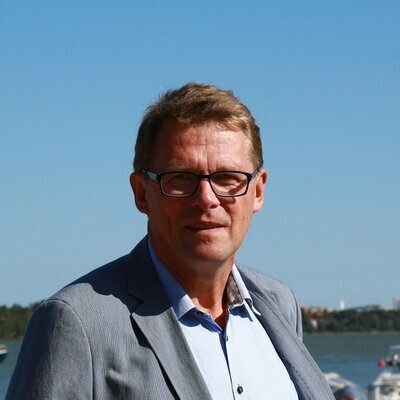 It is interesting to see him back into politics, modestly and courageously campaigning for a seat in the Finnish Parliament, going around his Uusimaa region and meeting people in markets, or in front of big supermarkets. It shows a touch of Finnish “sisu”, and from recent polls it seems to be effective. He has shared with Finland Politics his views on the present situation and the plans of the Centre Party, if it goes into power. What did you do before going into politics? As a young man, I was in a local newspaper, first a journalist, and then editor-in-chief. And in middle age—I was about 35 years old when I came to politics, to Parliament. And now, I have been, in the last 5 years, outside of politics, and now I’m coming back and running again. How did you come into politics? Was it a family topic? As a young man, I was very interested in some issues, especially about the housing policy, environmental issues, and international politics. And I was very active in local activities, in my own home area. So first, I came to local politics, when I was about 20 years old. And that actually activated me, also, to national politics. And why did you choose Keskusta? Keskusta was then, when I was young, very active in environmental issues. And I liked Keskusta, also, because it had so-called “decentralised” policies. So, Keskusta will not want to centralize everything to the biggest cities. It is working so that people can live all around Finland, in their own home areas and home countries. And the other reason was also that I respected, really, Keskusta’s foreign policy. What do you mean? What is Keskusta foreign policy, in specific? Then, of course, in the 1970s and 1980s, it was President Kekkonen’s policy. Kekkonen was our long-standing president, and he led our foreign policy very cleverly. That was then. Nowadays, of course, we are a member of the European Union, and Keskusta is cooperating internationally. We hope that Finland can work to have a positive impact in international politics, of course, and work efficiently with the other members of the European Union. We want to build this international cooperation, and in some themes, like climate policy, we are very active. We hope that we can somehow tackle climate change. What is your opinion about the situation with Russia now? Here, I’m worried. I know, personally, quite well the Russian leadership, but through the last year, I’ve been more and more worried about what is happening there. Finland—of course, our long tradition is that we have to manage with Russia, whoever is leading the country. We have been able to operate with them during the communist time, and also during Putin’s time. But we are worried, and we really hope that Russia could come back to normal international cooperation and follow the rules that we all have. We have to have international rules that are similar to everyone, and we respect others. Do you think that Finland should have a special role in relations with Russia? We have, because we have so long a common border, a special relationship with them. But of course, in the biggest political issues, we are a member of the European Union, and the European Union has a common foreign policy. And of course, we are supporting that and following the EU’s policy. But it cannot mean that we don’t have also bilateral contacts with Russia. We have so many practical bilateral issues, which we have to manage with them. Your campaign is under the theme of “realism.” What does that mean? It is, of course, mostly about our economic policy, entrepreneurial issues, how we can get growth, how we have to stabilise public finances. But also, it’s a message to foreign policy. And what about the financial situation? Finland has debts, and there are discussions about cutting in the state budget. In which domain should the cuts be done? Yes, we have to cut. Our debt, if you count together the state debt and municipality debt—the total deficit is somewhere between 8 and 10 billion annually, and we cannot cut all of that at once. But we have to start to cut, or to continue the cutting. And Centre has counted that we have to cut, in the beginning, something from 2 billion to 2.5 billion. But the main efforts to stabilise the public finances have to be the economic growth. We have to be very much, much more active in entrepreneurial issues. We have to somehow get back our competitiveness, because foreign trade is so important to us. And now, when we are part of a common currency, the euro, we cannot go for a devaluation of our currency. But somehow, we have to make an inner devaluation, so that we can get back our competitiveness. It is probably the main question for the new government. Another internal issue, in the health and social affairs domain: there is this reform which is on the table. Is the Centre Party going to take it immediately? Yes, it is so that the new government would have to make a new deal quite immediately. And my experience is that that type of big administrative reform will take the whole four years’ time to implement. But first, we have to decide about the main principles, and then prepare it well and implement it. So, it will be—maybe, if we think about how we can increase the productivity of the public sector, then also health reform will be the main issue. But what should be the place of the private sector, for Keskusta? It is important. Of course, we think that public health services are the main issue. There has to be equality among the people, and the public sector guarantee that. But also, the public sector can use the private health companies, and we hope that we can also find solutions where the people can also make the choice, and in some cases, they can also select the private services. Like vouchers. There has been good experiences about the voucher system. And it’s also good that public services have some competition with the private services. It guarantees that the public sector has, from inside its own organization currently, a productivity process that is going all the time. And among the reforms you asked about the environment, and climate change—is there something that you are going to do fast? Yes. Already, when I was Prime Minister, we decided on something called EU Environment Action Programme to 2020, concerning the climate change and energy policy—and for the Centre Party renewable energy is the main issue, and increasing the use of renewable energy is the practical way how we can tackle the climate change. Then we decided that in 2020, our share of renewable energy had to be 38%. Now we have something more than 30%. And so, there will be a lot of implementation during the next few years, especially in bio-energy, wind energy, solar energy, and so on. Are you going to do like the Germans and decide that you phase out fossil energy in 2050 or at some time? I’m realistic, and I believe that in 2030, we can probably end the use of coal. But with other fossil fuels, especially oil, maybe 2050 might be the time limit. And then the natural gas—I don’t have any special position on that. It’s not so bad, so probably natural gas will be used a longer time. How is it to be campaigning again? Of course, I considered it very deeply, “Will I run again?”. And now, I do it, 8 years after my last campaign, and I am especially surprised by the need to use social media: 8 years ago, I didn’t do Facebook or Twitter, and nowadays it seems so important! And I am not sure if I use them enough, or strongly enough. But for me, this type of happenings where I can meet real people face to face is the main way to campaign! What’s the possibility that Matti Vanhanen can talk to the Russian leadership whom he knows quite well to find out the truth about what happened in Ukraine? There has been an astonishing, nearly-absolute difference in descriptions/narratives about what really happened, and the people of Ukraine would have much greater hopes for the future if decisions – political, financial, military – were based on the total truth about Maidan, the civil war, Crimea, etc. One can see how Crimea, the location of Russia’s only warm water naval base, and only water route to the Mediterranean, could have become seen as at risk. These are important war and peace issues that are being reported, as mentioned, with nearly completely different, opposing narratives. One can envisage an interview like this one with a high Russian official and Mr. Vanhanen both focused on getting to the real story. Here in the US people can’t find any in-depth discussions about Ukraine, so the people are basically ignorant while lawmakers make their consequential decisions. Has there been any discussions in Finland regarding leaving the euro and establishing a public-utility central bank (not owned by private interests) to create Finnish society’s sovereign money debt-free?